•	How does your company use 3D printing? •	What is the landscape of 3D printing/additive manufacturing today? •	How has it changed over the past 30 years? •	How does your company plan on using 3D printing in the future? We had 1,295 industry professionals respond, including engineers, designers, CEOs, and buyers from the consumer, medical, aerospace, transportation, defense, energy, and automation sectors. They provided a wealth of knowledge, revealing how they rely on 3D printing today, and plans for the future. 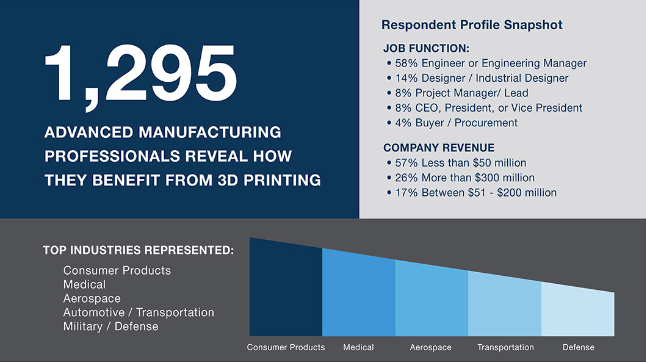 Perhaps one of the most interesting points of data was the discovery that over 94% have integrated 3D printed parts into their manufacturing processes and/or production parts. Here is that breakdown along with a few other insights.